Just a quick little quilt made from my scrap bin. I used the pattern from Simply Retro ( I got this book for Christmas!) as inspiration, but sized it way down to accomodate my scraps. I think I cut the squares at 2.5". Sure makes for some cute little blocks. The binding method I used this time was to wrap the backing around to the front. Tutorial here. 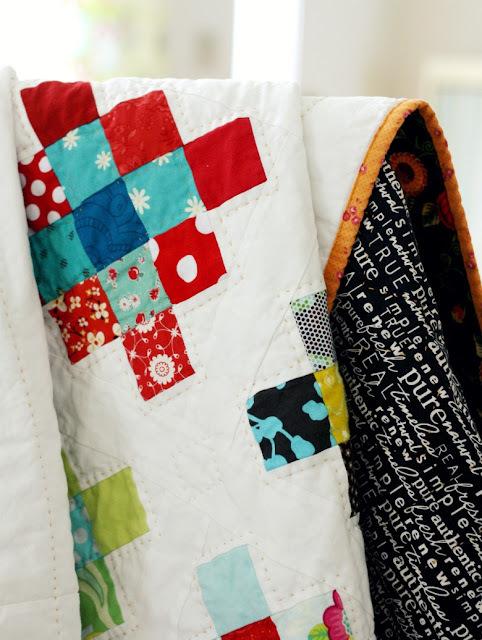 This is a quick and simple way to finish up your quilt. Wonderful quilt, great colors and I always love the texture of your quilts. Beautiful! Lovely scraps and i was using some of the pixel print in my rose star epp last night! It's such a great print! Oh, Jolene. You make me want to rifle through my scraps right now. I can tell my kids are influencing me because I saw your backing and immediately thought of minecraft. Fun! Thank you for the link to tutorial. It was great as well. Great quilt! Love the binding!!! I would love to have your scrap bin! Beautiful quilt. I just love your color choices. 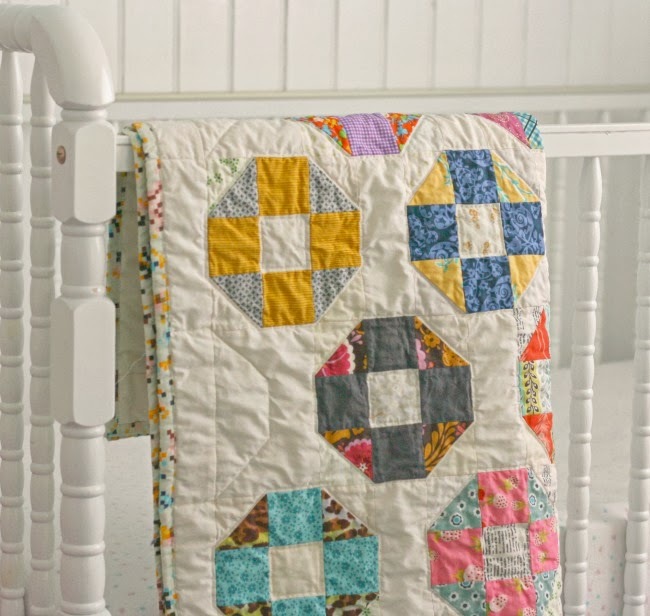 What an adorable little quilt! Love those blocks in your smaller size. The backing fabric (those cool little pixels :) ) is a Jay McCarroll print from his Habitat line. It has been out for some time so I don't know where you would find it. Wonderful quilt! So nice result! I LOVE this little piece! It is so sweet and soft and cushie and fresh! Love it. 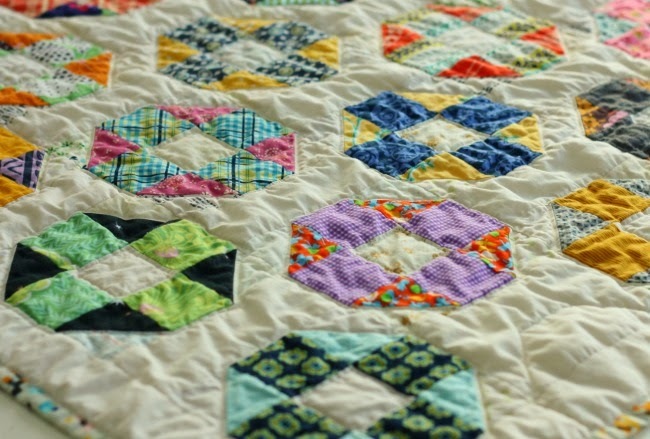 The quilted spools are a perfect little surprise. Oh I love this! I just started collecting original feed sack prints and this is a great pattern for them! I love how you made it scrappy! It's beautiful! What a fun quilt! And yay for using up scraps! I love this! I have some very small pieces of vintage fabric and this would be wonderful. Your color combinations are lovely, as always. 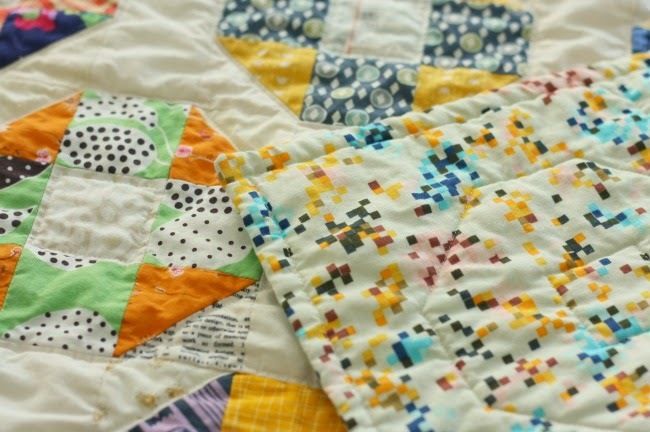 I'm always so inspired by you to take my quilts further. Blessings! 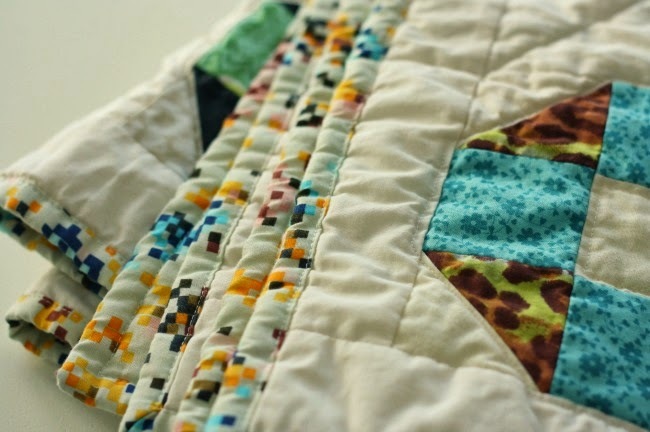 This is a perfect scrappy quilt. Wonderful! i love seeing the little bits of low volume prints with the white. adorable! This is fantastic - I'm going to have to try my hand at this one! So simple and classic. I love this quilt! The pattern is great. And your scrappy pairings are super.